Starting on Wednesday, the Engineering and Computer Science Association hosted seven competitions constructed by the Quebec Engineering Competition.These competitions were open to all undergraduate engineering students at Concordia University. The competitions challenged varying degrees of skills and competencies in engineering. Similar competitions will be happening in universities across Quebec. This was the preliminary competition for the QEC. The winners of the competitions at Concordia University, and in participating universities of Quebec, 250 participants in total, will be participating in QEC in Sherbrooke on Jan. 25 to January 28. The theme of the preliminary competitions and of the QEC this year is sustainability. The winners at the QEC will then be able to participate in the national engineering competitions. The QEC will be held in Sherbrooke in 2018, and will be celebrating its 33rd year of competitions in January. Concordia has been participating in these competitions for years. 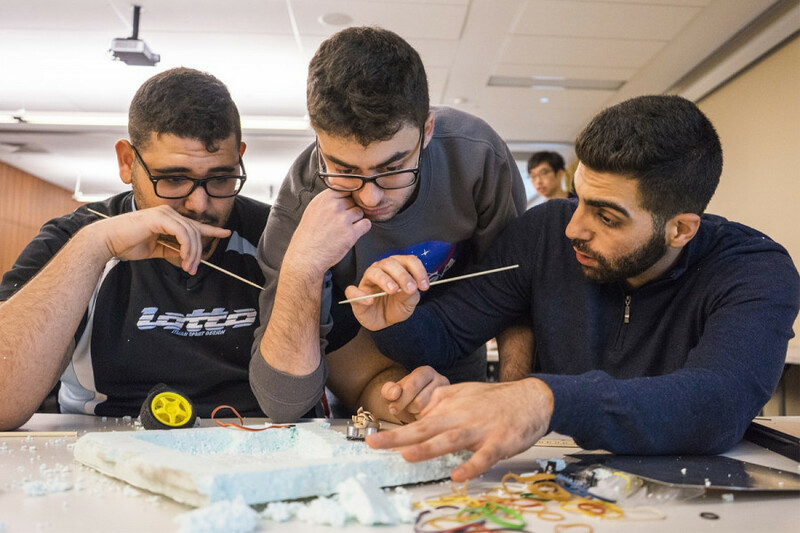 Abir Fakhreddine, VP of Competitions at the ECA, decided to coin the competition “Englympics Concordia” this year, she said, in order for the pre-competitions to reach the entire EMTS demographic of Concordia. She participated in QEC last year, and has participated in many engineering competitions in her four years at the university, and realized that Concordia isn’t taken seriously at these events. With this name change, she hoped to build a strong delegation for the CQI, in order to have a competitive advantage. This year, there were about 100 participants, she said. “The competitions were amazing, and they’re free of charge,” she said. On top of organizing the Englympics, Fakhreddine also participated in the consulting competition, where her team won. The case for the consulting competition was to build completely autonomous eco-neighborhoods, within Sherbrooke city, with hopes to make Sherbrooke the global leader in sustainable development, she said. They had four hours to crack the case, they were in teams of four, and then they had to do a presentation. Some of the judges were MBA graduates who were Concordia students, others were engineers, some were Deloitte employees. To make sure the competition was credible, she made sure to get judges from the industry, who are professionals. In Senior and Junior design, which were the most prestigious events, judges took the time to come in for a couple of hours to judge the competitions. Alex Stodja, VP of Marketing at the ECA, took part in a competition in Rimouski last year, as did Fakhreddine. He said it was an amazing experience and wanted the opportunity to participate this year as well. The re-engineering competitions, which he helped organize, were given two different designs. “One for rain gutters, and one for wind power plants,” he said. “Their objective was to re-engineer them—to come up with something that is flawed about the design, or come up with something that could be done better, and explain it to the judges. For example, if the rain gutter is made out of material that pollutes, competitors could re-engineer that with a better material, such as plastic,” he added. The work was divided amongst the executives so that some could participate in some events while others helped delegate, he said. Other competitions included events in communication, debating, and several design competitions. If you missed the opportunity to partake in Englympics this year, he said, the Engweek competitions will be happening in March. Troitsky Bridge Building, an annual engineering competition, is happening in March as well. For more information about the ECA, and about the competitions they will be hosting, go to their Facebook page ECA, call them at (514) 848-2424 ext. 7408 or drop by at H-838.